During Stockholm Fashion Week, Swedish steel and metal organization Jernkontoret presented new and innovative ways of using metals. Traditionally, using metal in industry might lead the thought to heavy construction, but nowadays metals can be used and processed in a variety of manners. The R&D executive at Jernkontoret, Anna Ponzio, chose to have the Unravelling Stent as one example of innovative uses of metal, by combining a medical need, knitting technology and nitinol wire into a whole new product category: removable stents. 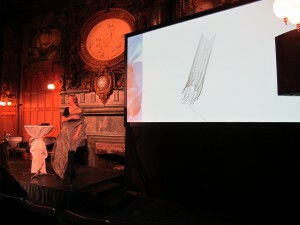 The Unravelling Stent was presented during the Fashion Hybrid session during Stockholm Fashion Week the 27th of January at Operakällaren. – It’s exciting to see what projects like this will lead to in the years to come, says Anna Ponzio to the trade magazine Bergsmannen. Who knows what fascinating innovations in knitted metals that will come in the future? Anna’s presentation on Stockholm Fashion Week can be seen on the video below (Only Swedish).